Recently, I accepted a position as the Converged Infrastructure Discipline Lead for the Americas within EMC. I have been so fortunate to work at such a great company with such great individuals. The last 5+ years at VCE has been my favorite time within my career. Last week was my first week and I am still getting up to speed along with developing the framework. I am very much looking forward to the role and all that it entails. Below, I have included a few details in reference to the Converged Infrastructure Discipline Lead for the Americas role. Data Center thermal analysis has always been of great interest to me. Last year, I conducted Vblock and VNX DAE Thermal Imaging which was very beneficial. Over the next few months, I plan to start working with a very detailed data center design and analysis suite called 6SigmaRoom (Computational Fluid Dynamics) from future facilities. Below, I have included two short videos that I have posted to YouTube along with photos in reference to general capabilities. To get started, I will be utilizing the Lite version which has a 30 day trial to start digging deep into the product. Products like this represent the framework to take data center design and analysis to the next level. future facilities solutions are used by design firms and owner/operators alike throughout the lifecycle of the data center to ensure availability, capacity and efficiency. future facilities ACE Performance Score provides a visual measure of these three interrelated variables in one holistic metric. future facilities is part of a working group at The Green Grid that is developing a standard for measuring such performance, just as PUE currently looks at efficiency. The PDF link below explains ACE and how it has been used by Bank of America to save over $10M. I have found four great books as I prepare for the Schneider Electric Data Center Certifications (http://socal-engineer.com/computing-blog/2015/6/3/schneider-electric-data-center-certifications) and the Certified Data Centre Design Professional Certification (http://socal-engineer.com/computing-blog/2015/6/3/certified-data-centre-design-professional-cdcdp). All four of these books are very helpful and I regularly utilize them as reference material. I plan to start another certification after having the Schneider Electric Data Center Certified Associate Certification completed by Friday June 12th and the Schneider Electric Professional Energy Manager Certification completed by Friday June 26th. The Certified Data Centre Design Professional (CDCDP) track is one of the most prestigious certifications in the area of Data Center design. There are so many areas in reference to improvement and optimization of physical data center infrastructures. There are very few in the world that have the intimate knowledge of data center computing/storage/connectivity/software coupled with physical data center design. I have always worked in both of these core areas but I strongly believe that this is the next step in my professional development. The complete training track and certification is $5,750.00 and runs for 7 consecutive days. In co-location data centers, it’s all going to be about optimizing every physical component within a data center. I strongly believe that this track/certification would go a long way in reference to next generation data center design aligning with LEED Certified Facilities. Learn how to scope, plan and implement a Data Centre design to meet the ever expanding demands of today’s modern business environment. Utilizing current industry best practices and applicable standards across the key Data Centre infrastructures. The program has a comprehensive agenda that explores and addresses the key elements associated with designing a Data Centre. It teaches industry best practice principles for the design, construction and operation of computer rooms and Data Centre facilities. The program also breaks down and addresses the requirements of a successful design to meet the business needs incorporating the key infrastructure elements of the physical infrastructure, electrical distribution systems, air-conditioning, data cabling and building support systems. It concludes with a comprehensive case study exercise that leads delegates through the design steps from initiation to commission, covering the business decisions, design scope and implementation phases that need to be addressed throughout the design configuration process. Industry best practices are achieved by bringing together the direction and guidance from British, European, US and International standards. The CDCDP program content is continually updated to reflect the current Data Centre industry design practices and supporting technology. The CDCDP program is a classroom based and led by one of CNet Training’s expert instructors. The program is designed for individuals involved with, or responsible for an existing data centre, or those looking to achieve best practice when designing and implementing these facilities. Suitable for those with experience in the data centre sector, the program covers in-depth issues on a wide range of relevant topics and is consistently updated to reflect the latest trends and developments. Students gain a comprehensive insight into the essential elements of data centre design and how to address them in a variety of situations and applications. I always attempt to stay ahead and tie as many computing, storage, connectivity and data center based concepts together. Over the last two years, I have been studying heavily in reference to physical data center designs (emphasis on LEED Certified Facilities). I posted an entry on my engineering blog last year (Cisco Allen Data Center Interactive Tour - http://socal-engineer.com/computing-blog/2014/4/14/cisco-allen-data-center-interactive-tour) in reference to these topics. This compilation came from publically available Cisco resources and provides as nice walk through of a modern day data center. Below, I have provided information in reference to two Data Center certifications that I am obtaining (The Schneider Electric Data Center Certified Associate and Schneider Electric Professional Energy Manager Certifications. The course fees for both tracks are free + exam fees. I plan to have the Schneider Electric Data Center Certified Associate Certification completed by Friday June 12th and the Schneider Electric Professional Energy Manager Certification completed by Friday June 26th. Given my current schedule, a majority of the courses, studying and exams will be completed during the weekends. Building Controls III: Introduction to Control Loops. The new Home Storage Array is coming to life (Photos Below). My configuration is an AKiTiO Thunder2 Quad Mini (Thunderbolt 2) with 4 Mushkin Enhanced Reactor MKNSSDRE1TB 2.5" 1TB SATA III Internal Solid State Drives. At a minimum, my VMFS Datastores within this configuration will average around 1300 MB/Sec Reads, 1200 MB/Sec Writes and 150,000 IOPS (4 KB Reads/Writes). This little monster will be conected to my new vSphere 6.0 Lab on Mac Pro (http://socal-engineer.com/computing-blog/2015/4/1/new-vsphere-60-lab-on-mac-pro). Performance benchmarking results write-up coming soon. Note: For steps 3 and 4 below, replace /dev/disk1 with the device path that your system lists (Example: /dev/disk1, /dev/disk2, etc). I’ve gotten tired of the technical issues in my vSphere 5.5 lab as I study for the CCIE Data Center. Recently, I ordered a Mac Pro (3.5GHz 6-core with 12MB of L3 cache, 64GB (4x16GB) of 1866MHz DDR3 ECC, 1TB PCIe-based flash storage and Dual AMD FirePro D500 GPUs with 3GB of GDDR5 VRAM each. This new Mac Pro will handle all of my complete vSphere 6.0 lab needs and should scale very nicely. I also ordered a AKiTiO Thunder2 Quad Mini (Thunderbolt 2) with 4 Mushkin Enhanced Reactor MKNSSDRE1TB 2.5" 1TB SATA III Internal Solid State Drives. At a minimum, my VMFS Datastores within this configuration will average around 1300 MB/Sec Reads, 1200 MB/Sec Writes and 150,000 IOPS (4 KB Reads/Writes). The entire cost for this solution was a bit pricy but it should rival most large scale solutions on a smaller scale. Performance benchmarking results write-up coming soon next month. From time to time, I receive inquires in reference to VCE Vblock Model correlation to the specific EMC Storage Array model. Extended Vblock model details are available at http://www.vce.com/products. The best reference documentation for each Vblock model is the “At-a-Glance” material. Below, I have put together notes in reference to the specific EMC Storage Array model(s) that is utilized in each respective Vblock. Like all recent versions of OS X, Yosemite is distributed through the Mac App Store. As with the Mavericks installer, if you leave the Yosemite beta installer in its default location (in the main Applications folder) when you install OS X 10.10, the installer will delete itself after the installation finishes. If you plan to use that installer on other Macs, or—in this case—to create a bootable drive, be sure to copy the installer to another drive, or at least move it out of the Applications folder, before you install. If you don't, you'll have to redownload the installer from the Mac App Store before you can create a bootable installer drive. You’ll find Disk Utility, a handy app that ships with OS X, in /Applications/Utilities. Here are the steps for using it to create your installer drive. The procedure is a bit more involved with Yosemite than it was for Mavericks (which was itself a bit more involved than under Mountain Lion and Lion). Right-click (or Control+click) the Yosemite installer to view its contents. 1) Once you’ve downloaded Yosemite, find the installer on your Mac. It’s called Install OS X Yosemite.app and it should have been downloaded to your main Applications folder (/Applications). 2) Right-click (or Control+click) the installer, and choose Show Package Contents from the resulting contextual menu. 3) In the folder that appears, open Contents, then open Shared Support; you’ll see a disk image file called InstallESD.dmg. 4) Double-click InstallESD.dmg in the Finder to mount its volume. That volume will appear in the Finder as OS X Install ESD; open it to view its contents. 6) Launch Disk Utility (in /Applications/Utilities) and then drag BaseSystem.dmg (in the OS X Install ESD volume) into Disk Utility’s left-hand sidebar. 7) Select BaseSystem.dmg in Disk Utility’s sidebar, and then click the Restore button in the main part of the window. 8) Drag the BaseSystem.dmg icon into the Source field on the right (if it isn’t already there). 9) Connect to your Mac the properly formatted hard drive or flash drive you want to use for your bootable Yosemite installer. 11) Warning: This step will erase the destination drive or partition, so make sure that it doesn’t contain any valuable data. Click Restore, and then click Erase in the dialog box that appears; if prompted, enter an admin-level username and password. 12) Wait for the restore procedure to finish, which should take just a few minutes. 13) Open the destination drive—the one you’re using for your bootable installer drive, which has been renamed OS X Base System. Inside that drive, open the System folder, and then open the Installation folder. You’ll see an alias called Packages. Delete that alias. 14) Open the mounted OS X Install ESD volume, and you’ll see a folder called Packages. Drag that folder into the Installation folder on your destination drive. (You're replacing the deleted Packages alias with this Packages folder.) The folder is about 4.6GB in size, so the copy will take a bit of time, especially if you’re copying to a slow thumb drive. 15) Also in the mounted OS X Install ESD volume, you’ll find files named BaseSystem.chunklist and BaseSystem.dmg. Copy these files to the root (top) level of your install drive (OS X Base System, not into the System or Installation folder). 16) Eject the OS X Install ESD volume. You now have a bootable Yosemite install drive. If you like, you can rename the drive from OS X Base System to something more descriptive, such as Yosemite Installer. Since 2000, the EMC Symmetrix product line has been my main focus. Over the last 14 years, I have worked with about every Active/Active and Active/Passive Array that were/are on the market. The main constant with the EMC Symmetrix product line has been its ahead of the market innovation nature. This constant drive to create the most innovate platform has enabled the Symmetrix product line to provide industry leading features in reference to stability, reliability and performance for a majority of the world largest companies. My performance engineering relationship goes all the way back to the Symmetrix 8000 Family (Symmetrix 5). I have always whole heartily believed that the Symmetrix platform has/is ahead of its time and is truly ahead of the competition. Below, I have put together some information in reference to the historical releases of the Symmetrix Family along with the associated drive technologies. A little walk down memory lane. Note: The image quality in the embedded photos (Below) are substantially reduced for faster web page load times. Quick photo while working on some Symmetrix VMAX Storage Arrays in the lab. Here is the public link (Below) information around the Cisco Allen Data Center Interactive Tour. I was so impressed with the wealth of information around the Allen Data Center along with the Richardson and Bangalore Data Centers. I went through and captured all of these Cisco Allen Data Center pictures (Below) from this Interactive Tour around the Infrastructure and Data Halls 1 and 2. The Cisco Allen Data Center is certainly cutting edge. I thought that this would be nice reference material to put together in case anyone wanted further details around the Cisco Allen Data Center. -The building was designed to withstand tornado winds up to 175 mph. -The UPS room (uninterruptable power supply) room in the 5 megawatt data center uses rotary flywheels, which require little energy to continue in motion and start the diesel generators in case of power loss. -The data center is cooled by an air-side economizer design, which reduces the need for mechanical chilling by using ambient fresh air when the outside temperature is low enough. Cisco calculates the facility can use filtered, outside un-chilled air 65 percent of the time, saving the company an expected $600,000 per year in cooling costs, while contributing to its corporate green goals. -Cisco also opted to forego a raised floor environment and use overhead cooling and cable management. The overhead cooling ducts drop air into each cold aisle, where it enters the servers and then is vented through a passive chimney system in the rear of each enclosure and into an overhead return plenum. That’s a change from the design in Richardson, which uses a 36-inch raised floor. -A lagoon captures rainwater to irrigate the indigenous, drought-resistant landscape plants. -Solar cells on the roof generate 100 kilowatts of power for the office spaces in the building. -Cisco has submitted the data center for Gold certification by Leadership in Energy and Environmental Design (LEED). Developed by the U.S. Green Board Council, LEED provides builders with a framework for measurable green building design, construction, operations, and maintenance solutions. -Cisco has designed the Allen data center to achieve a Power Usage Effectiveness (PUE) metric of 1.35. I have received requests around the configuration of my complete vSphere 5.x Home Lab. I have been running 2 of these ESXi Servers with 32 GB of RAM each and they run awesome. As requested, I have included Compute, Storage, Network and Cabling build details below. My final complete vSphere Home Lab consists of 2 - 2.9 GHz (Quad Core) Processors with 32 GB of RAM Each, Solid State Drive and 7200 RPM Drive NAS Storage Array with a 24 Port Gigabit Network Switch. The final cost for the entire lab was $3,673.73 (Compute, Storage, Network and Cabling) (Without Tax and Shipping) with a majority of the cost ($2,519.91) for the storage. The total cost of $3,673.73 may sound a bit expensive but I assure you that it has already paid off. It amazes me that 2 vSphere 5.x Servers with a combined processor pool of 5.8 GHz with 8 Cores and 64 GB of RAM can be purchased for $943.86. A lab like this can be created at an even lower cost (1 ESXi Server + NAS + Gigabit Switch) for $600.00 - $800.00. My configuration is around my requirements for Storage/Server/Network Trunking and Jumbo Frames along with Solid State Drives within a Multifunction/Muti-Protocol 8 Slot NAS. Packing and Shipping – I have received inquiries around being able to pack and ship a configuration like this. All of my home lab contents can fit into a 24” (Length) x 17” (Width) x 10” (Depth) area. The details for the shipping container are listed below at the end of this e-mail. Coming Soon: As time allows, I plan to conduct storage performance tests with and without Trunking and Jumbo Frames. I also plan to install an energy monitor on the main feed to calculate daily watts consumed along with energy costs per day. 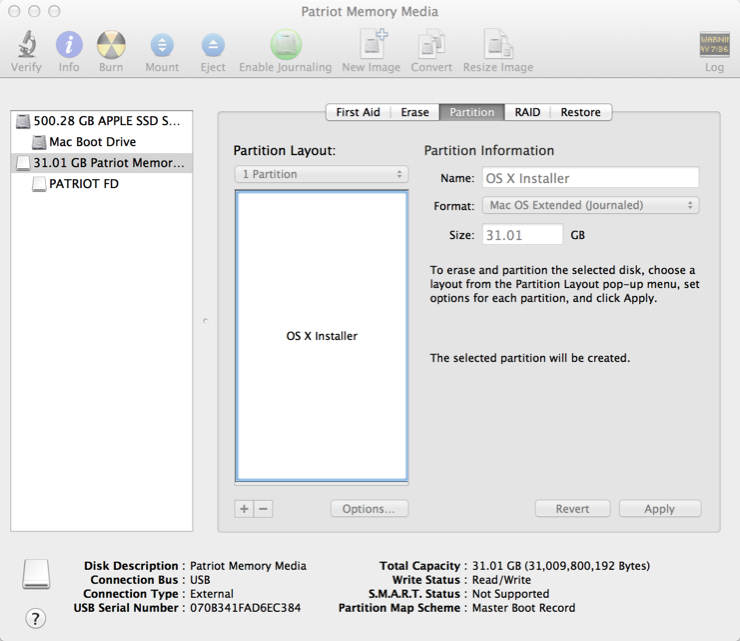 I have built 2 configurations with the only difference being around 16 GB or 32 GB of RAM. The AMD 2.9 GHz Quad Core with 16 GB RAM configuration is $391.93 and the AMD 2.9GHz Quad Core with 32 GB RAM configuration is $471.93. In this particular configuration, the RAM is running at a frequency of 1600 MHz but the AMD Processor is capable of running at a maximum of 1866 MHz. Mushkin offers RAM at 1866 MHz but it is a bit more expensive. This is something to consider if you are engineering a solution around maximum possible performance with limited bottlenecks. These systems run at a very low power consumption rate since they are not utilizing a hard drive or CD\DVD drive in the final configuration. Note: You will need a SATA CD\DVD Drive to install the base ESXi image but it is not needed for day to day operation. Note: This particular motherboard is capable of supporting 16 GB Memory Modules for a total of 64 GB. I have outlined the complete process below to setup Dynamic DNS, Router Port Forwarding and Windows Remote Desktop to access your vSphere (Or Any) environment behind your home router from anywhere in the world for $25 .00 annually. 1. Create a DynDNS account at http://dyn.com/remote-access/. 3. Select Add Host Services. 4. Select a Hostname along with one of the free available domains, Host with IP Address for the Service Type and select "Use Auto Detected IP Address x" which is your public WAN IP Address. Finally, select the Add to Cart button. 5. Select the Next button to check out of the Shopping Cart. 6. Select the Activate Services button at the Free Services Checkout page. 7. You will then be brought to the Host Services page which will display the Hostname to WAN IP Address. 8. 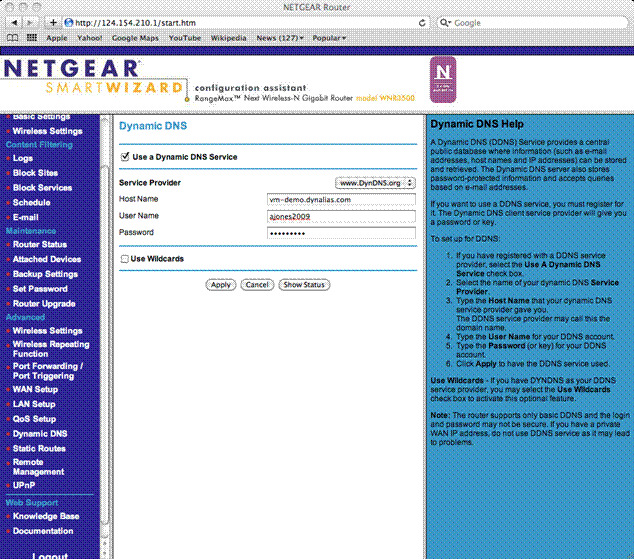 Login to your personal router and go to the Dynamic DNS section. I used a Netgear WNR3500 Gigabit Router ($99.99) athttp://www.newegg.com/Product/Product.aspx?Item=N82E16833122220). The Dynamic DNS Service is the most reliable but you can also install the service/software at https://www.dyndns.com/support/clients/ on a host. The supported hosts are Windows, Max OS X, Linux and UNIX. This service is very important since it periodically checks your network's WAN IP address; if it sees that your WAN IP address has changed, it sends (updates) the new IP address to your hostname in your DynDNS.com account. While still in the Dynamic DNS window on your router..
-Check mark Use a Dynamic DNS Service to enable the Dynamic DNS feature on your router. -Enter the hostname that you created on your DynDNS account from step 4. -Enter the username and password for your DynDNS account from step 1. 9. Go to the Port Forwarding / Port Triggering section on your router. Create a Port Forwarding entry. In this example, I have created a Service called Remote_Desktop, Start \ End Ports of 3389 for RDP and the Server IP Address of my Virtual Machine which could be your vCenter Server. Note: I have only gone through the process to setup Remote Desktop but many other ports can be forwarded. A full list of ports is available at http://www.portforward.com/cports.htm. 10. Go to a command line and ping your full domain name. It should resolve back to your WAN IP Address. Note: You will only get a reply while on your local network and not from outside of your local network. 11. Go into System within the Control Panel and enable Remote Desktop by selecting the Remote tab, check mark Allow Users to Connect Remotely to This Computer under Remote Desktop and then select Users to allow within the Select Remote Users button. Once completed, select the OK button to apply. Note: I occasionally turn off the Windows Firewall under Windows Firewall within the Control Panel to test network connectivity. The ability to ping over the LAN is not available while the Windows Firewall is in use. After completing your testing, re-enable the Firewall. There was a Remote Desktop Exception created within the Windows Firewall when we enabled Remote Desktop. 12. Disconnect from your direct connect or Wireless network and connect via a broadband card or via a network outside of your home. I am using a Verizon WWAN card. 13. Via the Windows Remote Desktop Connection client, list the host and domain name that you created in step 4. The host and domain name that you created in step 4 will resolve to your WAN IP Address and forward the Remote Connection onto Port 3389. 14. You are now connected to your Virtual Machine desktop. This is just an XP Virtual Machine that I will use as a portal to launch the vCenter Client. I have shown the example below of a single vSphere Node before I add it to vCenter along with the GUI of my Primary Celerra and VNX Simulator. Here is the performance testing that I ran on my Intel SS4200-E NAS Server running EMC Life Line for my Home VMware ESXi Lab. I used Iozone Filesystem Benchmark (http://www.iozone.org) for the performance testing below. The command with option that I used for this test was “iozone -Rab cifs_test.xls -i 0 -i 1 -+u -f Y:\cifs_test -q 64k -n 32M -g 1G –z” as an example. CIFS performance testing on my SS4200-E (4 - 1TB Drives in RAID-5) with 512 MB (Standard) Cache and with 1 GB (Upgraded) Cache. I observed a max write speed of 90.06 MB/sec and a max read speed of 53.17 MB/sec. A while back, I performed some extensive hard drive testing on one of my MacBook Pro laptops and noticed that some performance issues with Virtual Machines are due to hard drive performance. A few weeks ago, I found the 500 GB 7200 RPM Momentus XT Hybrid Laptop Drive that uses 4GB of SLC NAND Solid State Memory. Seagate calls this technique "adaptive memory" and states that the controller decides which particularly frequently requested data should be stored in the quick-acting flash memory. I ordered it off of Newegg for $119.99 with a coupon and free ground shipping. Conclusion: I have listed the 5400, 7200 and 7200 Hybrid overview data (From Testing A Few Weekends Ago) below along with detailed performance reports (PDFs Attached). I performed this testing on a MacBook Pro with 4 Cores and 8 GB of RAM. My testing found a dramatic performance gain in Sequential Reads with the 7200 Hybrid drives. ∑ Solid state hybrid drive delivers SSD-like performance with hard drive capacity options. ∑ Adaptive Memory technology customizes performance by aligning to user needs for overall improved system response. I have outlined the process below for Mac OS X 10.8 VM Configuration in VMware Fusion 4.x and 5.x. 1. Download Mac OS X 10.8 (Mountain Lion) from the Mac App Store. The direct link is http://itunes.apple.com/us/app/os-x-mountain-lion/id537386512?mt=12which has a purchase price of $19.99. 2. 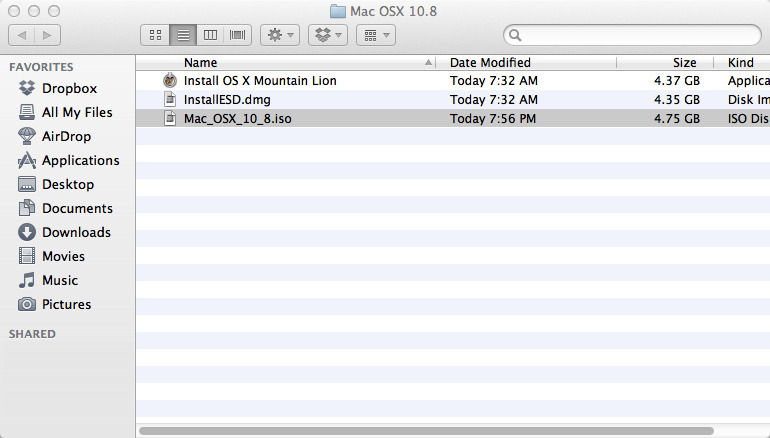 The Mac OS X 10.8 (Mountain Lion) image will be downloaded directly into the Applications folder. Be sure to make a copy of this 4 + GB file before performing any upgrades to your local Apple device. The installation scripts clean/delete the installation package after the upgrade from 10.7 to 10.8 is completed. 3. Right click the Install OS X Mountain Lion package and select Show Package Contents. 4. Once within the Package Content directory structure, go to InstallESD.dmg under the SharedSupport folder. 5. On your local Apple device, go to Applications, Utilities and then open Disk Utility. 6. Drag InstallESD.dmg from step 4 into Disk Utility. 7. Select the Convert icon from the top of the Disk Utility screen. 8. Name the file that you are creating with a .cdr extension. The .cdr extension will later be changed to a .iso extension. 9. Select DVD/CD Master as the Image Format and None as the Encryption Type. Next, select Save. 10. The .cdr image will now start the creation process. 11. The 4.75 GB .cdr image has been successfully created. 12. Select the .cdr image and change the extension to .iso. 13. Start VMware Fusion 4.x/5.x and and select File and New. 14. Select Continue without Disc. 15. Select Create a Custom Virtual Machine and then select the Continue button. 16. Select Apple Mac OS X for the Operating System and Mac OS X 10.7 64-bit for the Version. 17. The Mac OS X 10.8 installation screen will now appear to install Mac OS X 10.8 just as you would on a physical machine. 18. Go through the Mac OS X post installation process to complete the final configuration. 19. Go into the Virtual Machine Settings and change the CD/DVD (SCSI) setting from the Mac OS X iso used to the SuperDrive. Note: I have had to toggle the Enable CD/DVD Drive button from off to on to get the iso to release. 20. Go to Virtual Machine from the top menu and select Install VMware Tools. 21. Select Install from the VMware Tools dialog. 22. Select Install VMware Tools to proceed forward with the VMware Tools for Mac OS X 10.8 installation. 23. The Mac OS X 10.8 Virtual Machine is now fully configured for use within VMware Fusion 4.x/5.x. 1. Using a Mac with at least OS X 10.6.8 installed, access the Mac App Store and download the Lion (10.7) or Mountain Lion (10.8) app installer. 2. Insert the USB drive into the Mac and launch Disk Utility. 3. Click on the USB drive from the left-hand menu and select the Partition tab. 4. Click the drop-down menu, selecting 1 partition. 5. Select Mac OS Extended (Journaled) for the format-type from the drop-down menu. 6. Click on the Options button and select the radio button for GUID Partition Table and click OK.
7. Upon completion of the USB formatting, locate Install Mac OS X Mountain Lion.app (downloaded in step #1 to the Applications folder, by default). Right-click the file and select Show Package Contents. 8. Navigate the file structure Contents | Shared Support and drag the InstallESD.dmg file to the desktop. 9. Go back to Disk Utility and click on the newly formatted USB Drive in the menu, then click on the Restore tab. 10. In the Source textbox, click the Image button and select the InstallESD.dmg file on your Desktop. For Destination, drag & drop the partition created on the USB drive onto the textbox. 11. Upon verifying that the fields are correct, click the Restore button and select Erase from the application, if prompted to do so. 12. The process may indicate in excess of one hour, but in my experience the process takes significantly less time to complete. 13. After the restore has completed, the Mac OS X Install (On USB Drive) will auto-mount. You can now unmount and remove this USB drive.